The Council on Higher Education remains a key player, in partnership with other stakeholders,in shaping the higher education system in South Africa. I have been honoured to steer the work of the Council in the 2014/15 financial year, and to oversee the induction of new members of Council appointed in December 2014 by the Minister. It is gratifying to have been working with Council members with vast experience and expertise in higher education and other sectors. In order to fulfil our fiduciary duties and ensure that there is good governance at the CHE, Council underwent an independent external evaluation of its performance, the results of which were pleasing to see. It was evident from the results that the CHE takes its role very seriously. Regular attendance of meetings, robust engagements in meetings, the quality of advice to the Minister and interactions in the higher education sector in various forms characterised the work of the CHE in the 2014/15 financial year. 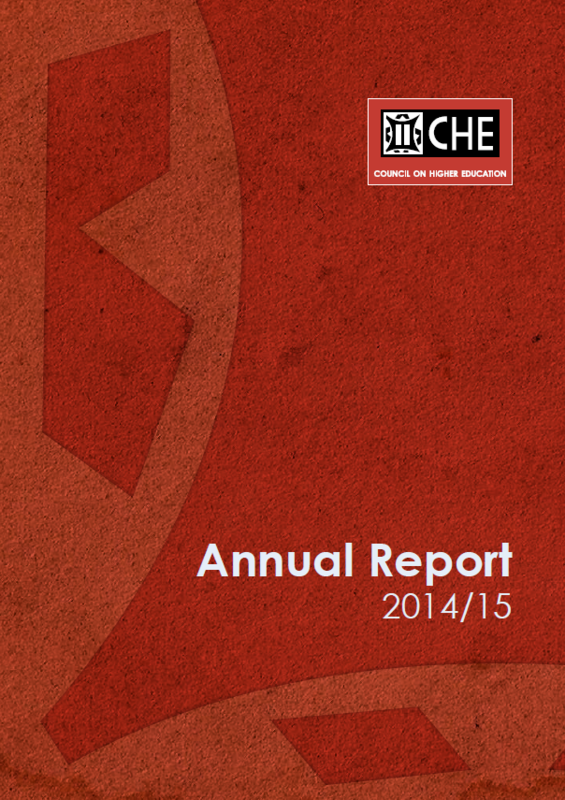 I am pleased to report that in this period, the administrative, financial and governance systems of the organisation continued on a sound footing already laid in previous years which enabled the work of the CHE to grow and develop as it implemented a range of new and exciting projects as outlined in this Annual Report. Although the projects are exciting and relevant to the development of the higher education system, there were a few challenges that affected the progress in some of the research projects. The time it takes to complete some of the projects is a challenge faced by Council. The CHE depends to a large extent on the expertise and willingness of peers in the sector to contribute to the work of the entity. There are instances where there are inordinate delays in completing the projects, and consequently an overlap into the next financial year. The improvement of quality in teaching and learning has been at the centre of many of the CHE’s projects. The first phase of the Quality Enhancement Project which was implemented in this financial year focused the attention of public universities, and to a lesser extent, private higher education institutions on improving four key aspects that underpin good teaching and learning and hence student success. The CHE is concerned about low throughput rates and is cognisant of a range of interventions put in place by institutions of higher learning together with the Department of Higher Education and Training through the Teaching and Development Grants to address this challenge. The CHE played a crucial role in these interventions through HELTASA, particularly in recognizing excellence in teaching at universities in this country. One of the legislative requirements for the CHE is to conduct institutional audits through its permanent Committee, the Higher Education Quality Committee (HEQC). In the 2014/15 financial year there was also extensive engagement with those institutions still busy implementing the recommendations of their institutional quality audits. The Improvement Plans are closely monitored, and some of the universities that encountered governance and management challenges were assisted to focus on their Improvement Plans in 2014/15. The challenge faced by Council was the closure of the first cycle of audits at some universities for various reasons. A robust accreditation system of the CHE has enabled the processing of 427 new applications, the accreditation of 324 programmes and 36 site visits across the country. In addition to this, a total of 53 programmes were re-accredited. As a result of the rigour involved in accrediting academic programmes, the CHE encountered legal challenges from higher education providers who had their accreditation withdrawn in the financial year 2014/15. As the custodian of quality assurance mechanisms, the CHE continues to preserve the integrity of the system by ensuring that our qualifications are beyond reproach. The legal challenges that purport variations and/or deviations from the well-considered criteria to assess the quality of provisioning at some private higher education institutions put a strain on the human and financial resources of the CHE. Council is, however, resolute that quality of teaching and learning shall not be compromised by legal threats and actions. In the year under review there were structural re-arrangements within the Council on Higher Education. The National Reviews Directorate was merged with the Standards Development Directorate to enhance interactions and synergies in setting standards and reviewing certain professional programmes. The Capacity Development and Quality Promotion Unit was housed within the office of the Chief Executive Officer to pull together projects across the organisation and maximise our output. The accreditation system, the national reviews, the quality promotion activities and the alignment of qualifications with the Higher Education Qualifications Sub-Framework (HEQSF) all contributed to the HEQC’s sharper focus on bringing about improvements in the quality of teaching and learning and in the offerings of our higher education system. The strategic direction signalled in the 2014 workshop of Council to strengthen the CHE’s relationship with other stakeholders, notably the Department of Higher Education and Training, other Quality Councils, institutions of higher learning and the Portfolio Committee on Higher Education and Training was aimed at enhancing the visibility and impact of the CHE as it executes its quality assurance functions, and provides advice to address the key challenges in the higher education system. This is still work in progress that overlaps into the 2015/16 financial year, but certainly one of the medium to long term goals of the CHE to increase its visibility and impact nationally and internationally. This strategic direction has been reiterated by the new Council. The level of engagement of the CHE with higher education institutions has, however, increased through its quality enhancement and promotion activities and through ongoing consultation processes regarding the CHE’s proposal for undergraduate curriculum reform. The latter informed the CHE’s comprehensive and proactive advice to the Minister to introduce an extended and flexible curriculum structure in undergraduate qualifications to address the major challenge of poor throughput and graduation rates in higher education. Advice on a number of policy-related matters was also provided in this period. As indicated above, one of the medium to long term goals is to increase the visibility and impact of the Council on Higher Education and playing a crucial role in the implementation of the plan to be crafted for the post school education and training sector. Adequate funding for the CHE to deliver on its mandate, within the shortest possible time, form part of the medium to long term goals of the entity. Roll-over funds from projects are not sustainable. The Council’s relationships and work with the South African Qualifications Authority, the Council for Quality Assurance in General and Further Education, and the Quality Council for Trades and Occupations have continued to be strengthened, and the priorities related to the NQF identified by the Minister for 2014/15 were advanced significantly, particularly through the near-completion of the HEQSF-alignment project. International linkages were also pursued through ongoing collaboration with other quality agencies in the Southern African region, with the Scottish Quality Assurance Agency, with a number of international projects and through participation in conferences and a number of international speakers at the CHE’s events. The CHE improved the rate at which it retained its staff through various human resources strategic interventions, and I am pleased to report that there is a stable work force dedicated to deliver on the mandate of Council. Attracting and retaining staff with superior intellectual capabilities remains a challenge that we hope can be mitigated by providing competitive remuneration and benefits in the medium to long term. The outcome of the audit by the Auditor-General of South Africa attests to compliance with legal requirements of the Public Finance Management Act. I would like to express my appreciation to the Audit and Risk Committee together with the management and staff for working hard and ensuring that the CHE had a clean audit in 2014/2015. In conclusion, I would like to thank all our partners who supported the work of the CHE in various ways in 2014/15. Higher education is confronted by many challenges, some of which if not addressed in a collaborative manner could reverse all the gains we have realised since the dawn of democracy. Diminishing resources and an expanded mandate of the post- school education and training system begs of all role players to “do more with less.” As I thank the Portfolio Committee on Higher Education and Training for the oversight role and support in resourcing the CHE in 2014/15, I commit the CHE to fulfil its mandate and utilise the scarce resources which we hope will improve in the next financial year. Thanks to the Minister,the Deputy Minister, Director-General and all the staff of the Department of Higher Education and Training for their support during the 2014/15 financial year.